Systems engineering application projects collage. 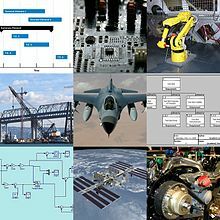 English: Systems engineering is an interdisciplinary field of engineering that focuses on how complex engineering projects should be designed and managed. Systems engineering is an interdisciplinary approach and means for enabling the realization and deployment of successful systems. It can be viewed as the application of engineering techniques to the engineering of systems, as well as the application of a systems approach to engineering efforts. Pages in category "Systems engineering"
Media in category "Systems engineering"